Many home improvements increase your enjoyment of your home, but some can also affect your home’s value – according to the Appraisal Institute of Canada: Adding or upgrading a deck or patio can yield a 50 to 75% return on investment at the time of resale. 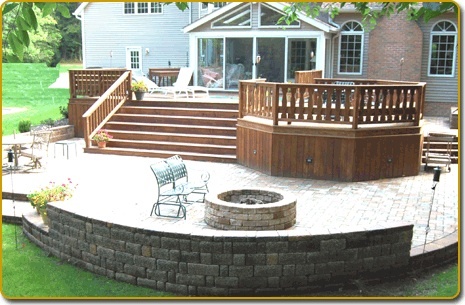 Truly Assess Your Wants and Needs – Decide on what the main purpose of your deck or patio should be. Will it be for entertaining? Relaxing? Or simply to improve the look and landscape of your yard? Answering this first question will help you determine the size, layout, and your need for things like eating areas and built-in seating. Do Lots of Research – Find out whether you require a building permit to meet fire and structural safety standards, even if you’re just upgrading an existing deck or patio. Always - check with the city's building department for permit related issues. Contact the Alberta 1 Call™ service to help locate any underground utilities if you plan on doing any digging at all. They're more than happy to help. Determine the Right Materials for the Job – Determine the right kind of deck or patio to fit your needs and climate. Wood is ideal for design flexibility, vinyl is very durable and low maintenance, and composite decking looks great and is eco-friendly. For patios, flag stones, cobble stones, brick pavers and concrete all offer durable and very cost-effective solutions. Pick the Right Shape for your Needs – Create a deck or patio that looks and feels like an extension of your home. Right angles convey a strong, sturdy look while soft or rounded angles help create a casual, and more relaxed atmosphere. For patios, allocate some space in your design for gardens or flowerbeds. Some families consider adding a hot tub since we don't have pools in our Calgary backyards - so consider this in your design. Location, Location, Location – Situate your deck or patio adjacent to an entry door of your home as this makes traffic flow much easier when serving a meal, barbecuing, or entertaining outdoors. Decrease the high of the deck or patio from the door threshold approximately 10 cm. to allow for our sometimes heavy winter snowfall. Consider Enclosures – Consider building an enclosure for your deck or patio. Enclosures made of screen, mesh, glass, or aluminum can help provide shade, protect against flying insects, and could allow you to enjoy your space in the rain or in colder temperatures. The right amount of ventilation is always something to consider. Remember to Accessorize – Complement your patio or deck with some stylish accessories like weatherproof wicker chairs, cedar benches, wind chimes, and even lounge chairs. You might consider installing outdoor electrical outlets so that you can enhance the ambience with additional lighting, music, or through utilizing other electrical devices. Use propane heaters to help heat the outdoor space on our cold Calgary summer evenings and prolong our patio season just a few more weeks. Don't Forget to Maintain the Space – Replace any deteriorating boards and rusty nails or screws, treat natural wood decks with a water sealant each year. Re-stain coloured decks each year to minimize the effects of the sun's UV rays. Use might consider using a polyurethane repair compound to minimize the appearance of cracks in your patio and apply an appropriate concrete sealant to protect your concrete against moisture and the sun's UV rays. Adding a patio or deck is like adding another room to your home. They’re a great way to expand your living space, get a little closer to nature, and entertain outdoors - even if it is only for a few weeks each year. They're tremendous to add space that you can enjoy every year! Depending on the quality of your installation, materials that you use and ongoing maintenance, your new patio or deck could carry a minimum life expectancy of 15 years with just a little bit of upkeep every year. For more information the benefits of adding a patio or deck, or on how to prepare your home for sale, don’t hesitate to contact the team here at the Calgary area Real Estate Professionals. We're always available to help ensure that you, your family, friends and associates have the best possible and most comfortable real estate experience possible.